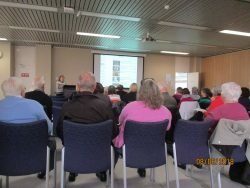 Unlock the Past held a genealogy and local history two day seminar in Perth on 8-9 June 2018 at the State Library of Western Australia. Friday’s program started with a comprehensive talk on Immigration to Australia by Kerry Farmer. This covered everything from the arrival of convicts, free settlers, emigration schemes and certainly gave the audience lots to think about. In the break someone said that their ancestor still ‘swam’ and I think there will always be those arrivals for which no records survive. I was meant to be the next speaker but as my luggage had been ‘misplaced’ and I was still seeking it, Kerry stepped in and did her afternoon talk. This was Finding Historical Photos Online and I did manage to catch part of this session. Kerry covered sites such as History Pin, Flickr, Pinterest, ArchivePix, the National Archives of Australia’s PhotoSearch, Australian War Memorial, Facebook, Royal Western Australian Historical Society, You Tube and Google Images. Images of places show where our ancestors lived and what it was like in that community. If you are lucky there may even be images of your ancestors online as people blog their family stories or attach photos to online family trees. Finally Kerry also said to check copyright, acknowledge sources and to record the source of the image. Then there was a coffee break and fortunately the State Library has its own cafe so we didn’t have to venture far for a nice cup of coffee. 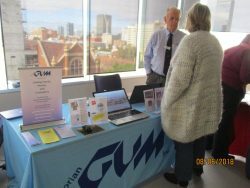 It was also a chance to check out the exhibitors including the Western Australia Genealogical Society (WAGS) which now has a business name Family History WA, VicGUM, and Gould Genealogy & History and their impressive range of Unlock the Past research guides and the new handy guides. 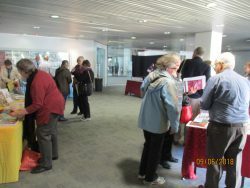 Anthea seemed busy with book sales over the two days and I think Alan also fielded a few questions about the Unlock the Past genealogy cruises. Kerry then did her final talk for the day on UK Records – English & Scottish BMD and Census & Valuation Records. Again a wide ranging talk with most of the sites mentioned familiar to me. These included the UK GRO, FamilySearch, Genuki, Dusty Docs, Scotland’s People, The Genealogist (especially if you have non conformist families), Ancestry, Findmypast and MyHeritage. Be wary of transcripts and always try to view the original record. The London Metropolitan Archives land tax records showing owner/occupier are available through Ancestry and valuation rolls on Scotland’s People can be useful. Lunch followed and that was a chance to chat with people and have a look around the genealogy section of the State Library. 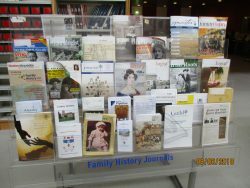 It has lots of print resources, magazines and journals as well as fiche/film and computer resources. There online guide Dead Reckoning: How to find your way through the genealogical jungle of Western Australia is a good starting place. After lunch Doug Elms from VicGUM spoke about why it is important to have a genealogy software program and not just one online. VicGUM is a self help group which has an active membership who communicate via email and their in person meetings are recorded for those unable to attend in person. There are members only resources online too. 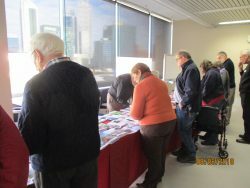 I used to attend and speak at some of their meetings when I lived in Melbourne and am currently a member. The online videos of meetings are just like being at the meeting except you can’t chat to others during the break! WAGS President Ian Simons then spoke on the benefits of joining a society and how members helped each other. 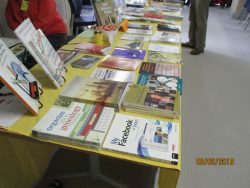 They also have their own library with access to the subscription databases as well as print resources. About half the attendees were not members of WAGS although some joined over the two days. There is certainly value in being a member of a society and WAGS has 16 special interest groups which shows how active their members are. I am currently a member of Genealogy SA, GSV, QFHS, GSQ and VicGUM which can be expensive so you need to ensure that you are making the most of any societies you belong to. Then it was my turn and the first talk was about Online Newspapers: new pathways to finding ancestors. I simply love what you can find out about your families through digitised newspapers including Trove, eResources from the National Library of Australia and State Libraries, British Newspaper Archives, Irish Newspaper Archives, Welsh Newspapers, the Digital Scotsman and current online newspapers to place advertisements or to send stories for publication. My talk is on the Resources page of my website, scroll down to Presentations. My final talk was School Days: Education Records for Family History and this was illustrated with stories from my own research as well as WA examples. I even included a photo of myself on my first day of school and a high school photo which seemed to interest the audience. Often we forget to include ourselves in the family history. I have used school admission records to help trace my mining ancestors who tended to move around a lot from mining field to mining field. Again the presentation is on the Resources page. A few of us then all went out to dinner and not surprising, the chatter was mainly about genealogy and the food. A relatively early night as most of us were still catching up to WA time which is two hours behind the eastern states. The Saturday program started with my talk Family History on the Cheap (available on the Resources page) which is a popular talk and there really are lots of ways to save money while researching. But I still maintain that people need to get as many certificates as they can as these documents may have clues not found elsewhere. After a quick coffee break, Kerry Farmer was next with DNA: I’ve done the test what next. This was relevant for me and I realise now that I need to test a few more people apart from my immediate family. For example, if I test some of my mother’s nephews or their sons I will have the Y DNA for the Price family. Similarly if I test on the Carnegie male lines, I may be able to identify the unknown father of my great grandfather James Carnegie. Exciting to even think about identifying the father of an illegitimate child. I have heard Kerry before but each time I listen to talks about DNA research I learn and understand a little more. Kerry also explained how it is possible to download raw data and to upload into various other DNA databases. This increases your chances of matching up with other family members as there are so many tests and databases. Lunch followed and I rather enjoyed eating at the Library’s cafe, quiet, fast and tasty. Onsite makes it easier for those who plan a whole day’s research and I really should think about doing the same at State Library of Queensland. It’s just the thought of the traffic on the highway not to mention in Brisbane that puts me off. Might be time to think about the train from Caboolture! After lunch Alan from Unlock the Past spoke about upcoming UTP events in 2018 and 2019 including road shows and genealogy cruises. There are some great events coming up so check out their calendar, especially if you are into DNA as Blaine Bettinger is coming downunder in August 2019. That one is in my diary but I will also hear him in Seattle, USA in September this year. Kerry’s next talk was GEDmatch: tools for DNA and genealogy research which was of interest as most attendees seemed to have done one or more DNA tests. GEDmatch is a central place where everyone can upload their data and find others with matching results. This is were I find it gets a little confusing as there seem to be so many matches. How to evaluate them and follow up was what I wanted to know and I liked Kerry’s suggestion to use 10cm rather than the usual 7cm as that rules out false matches. Know how to read matrix and triangulation reports plus there are even more resources with Tier One which is about $10 a month. I have already done Phased Data Generator for my father – I have my DNA and Mum’s so I can then create a profile for my father and look for matches. It will be interesting to see how this works. Then it was time for my final talk on Mining Records and this was based on one of my own families who left Sydney for the Victorian goldfields, then north to the Gympie gold field in Queensland before two of the brothers and their families headed to WA and the goldfields in the 1890s. While there are not a lot of indexed mining records we can still find them in other genealogy resources and of course, newspapers. Miners definitely moved around so we should look for them just about everywhere. The talk is on the Resources page of my website, scroll down to Presentations. 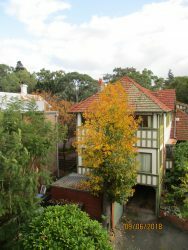 Wonderful autumn colours that I miss! The final talk was Kerry on Using Local History to Help Family History and we really can’t do genealogy unless we also look at our ancestors in their local communities. There are so many resources here including almanacs, directories, electoral rolls, land records, wills and probates, oral histories, maps and plans and other resources. Kerry said to ask questions eg why did they settle there, where was the school, or the church, what was transport like and who else was in the community. Then it was all over after the thank yous and good byes. As usual I have a list of things to follow up now that I am back home. Especially with the DNA as I am all keen again and determined to try and find out more about Dad’s family. It was great to catch up with my WAGS friends although I was only there two years ago. The weather could have been warmer and drier but that is all part of the travel experience. All four of my talks are on the Resources page of my website, and I can already imagine some of the attendees working their way through my talks again, only this time looking for their own ancestors. I hope they find them! Thanks to Unlock the Past for inviting me to be part of this event. Another wonderful genealogy opportunity. What a fab duo. Perth Genies were very lucky to hear your talks. 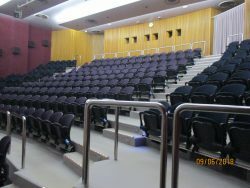 Great blog and thanks for posting the presentation notes. Thanks Jill and Bobbie for the comments. Just noticed that the blog post had comments.